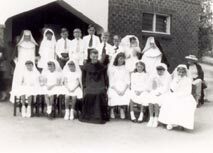 The Parish of Infant Jesus had it’s beginnings on July 4th 1954, when Fr. George O’Leary was appointed Parish Priest of what was then called St. Paul’s. Soon after a Church/School was built on Walter Road where Morley Markets now stands. With the arrival of Fr. Hilary Doran, OCD in late 1955, the Discalced Carmelites took responsibility for the parish. In December 1956, a four acre block was purchased on Wellington Rd and the wooden shack on the site became the first Carmelite Priory in Western Australia. At this time the name of the parish was changed to “The Parish of the Infant Jesus”. Early in 1960, due to a rapid increase in population, a new church was built on the site and the school also transferred to a larger site in Smith Street. Further growth in population necessitated the building of a new Church again in the early 1990’s, which together with the new priory and the Parish Centre, gives us the beautiful centre of Carmelite prescence and Parish life which we possess today. Our Church is open every day until 12.30pm and is a popular choice for couples to celebrate their marriage. When the new Church was built in 1992, the old Church was converted into a Parish Hall with meeting rooms, library, offices and fully equipped kitchen. Over the years it has become a hive of activity and a meeting place for groups and individuals. The Parish office within the centre is open four mornings a week. You are welcome to drop in anytime to say hello and have a cup of tea or coffee.